Rock....You dyed your hair! Hope that one is a little more reliable than the last FW cannon. Even a trained field artilleryman couldn't figure that one out! ... and it begins. It's on. Good times. What was your source on the barrel? Looks a little stubby. Shiny, though! Many years ago I got the barrel from a guy just as the Tulsa gun show was closing down on Sunday. He didn't want to carry it to his car and made me a deal on it. It sat for a few more years and I decided to do something with it. It had short trunions...maybe for a naval carriage....so a machinist patient of mine made them longer. 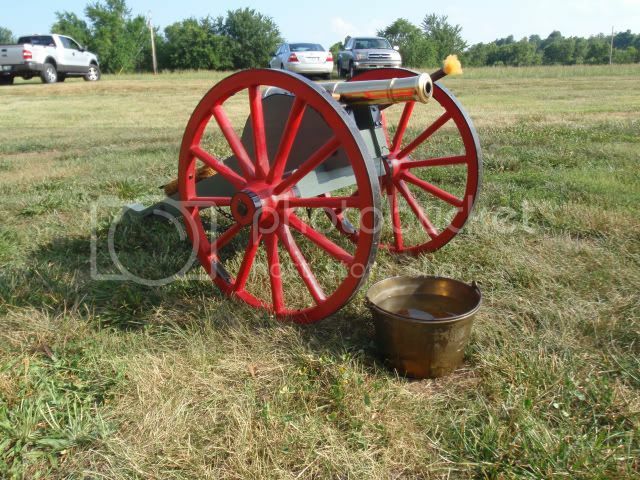 I got the field carriage from the old Cannon Mania website. It's not an exact fit but it's close enough that it works fine unless you want to shoot high angle. The bore is 1". I've never fired a projectile of any kind from it but it makes a hell of a boom with a bit of Fg black powder. We truck it out to my brother's place outside the city limits every 4th of July and fire all day. Hmmm, I wonder how far we could launch a one inch ball with it? Looks like """Rocky""" should have a damned fine chance of hittin the target. What is the internal bore pressure generated by a 1" steel ball of X weight in a 1" bore in front of a specified Fg black powder charge ignited by a burning fuze? What is the maximum PSI that an unknown alloy of cast? or milled? brass will safely withstand before bursting? If you don't have the answers to the above, I think we'll just call my cannon a "Salute Cannon"! you could shoot ping pong balls! Easy. The ball in front of two pounds of FFg will generate 7250 fps. at 4500 lup. The cannon will easily proof out in excess of 126,000 psi. Two pounds of powder would just be a giant salute 'cause there wouldn't be room for the ball!